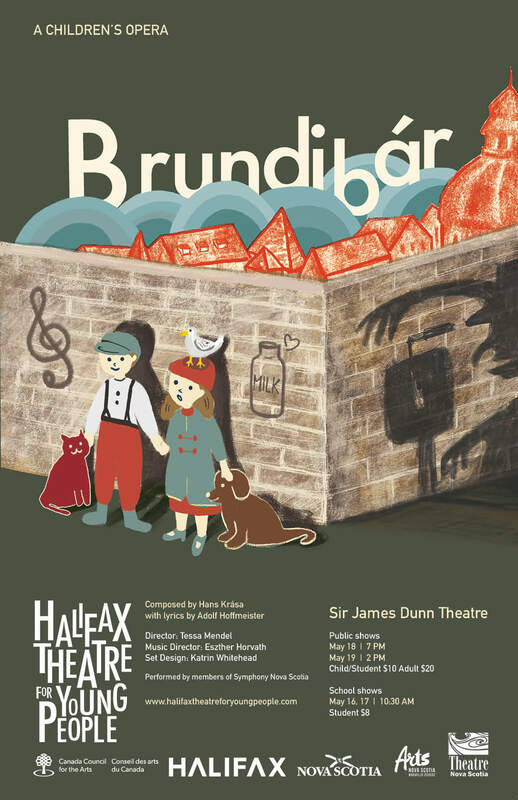 HTYP is very excited to announce its latest production: Brundibár, coming to the Sir James Dunn theatre May 18-20th. Brundibár is an opera written for children and performed at the Theresienstadt Concentration Camp. No more than forty minutes long, it was composed in 1938 by Hans Krása, with lyrics by Adolf Hoffmeister and received its premiere in German-occupied Prague at the Jewish Orphanage before the mass transports of Jews to Theresienstadt began in 1942. Directed by Halifax Theatre for Young People’s Artistic Director Tessa Mendel, with musical direction by Eszter Horvath, the production will feature professional musicians, including Scott MacMillan and members of Symphony Nova Scotia, children from the local community and professional set and lighting designers. The production, along with an educational component, guest speakers and a photography exhibit will take place at Sir James Dunn Theatre in May, 2019 with performances for both schools and the public. The Monster Under The Bed won’t have audiences screaming in terror. It’s more likely they’ll be cracking wide smiles and gig­gling loudly after seeing the latest production by Halifax Theatre for Young People, now onstage at Alderney Landing in Dartmouth. As the father-daughter mon­sters, Christian Murray and Keel­in Jack are exciting — and excit­able — new playmates for eight­year- old Ben, played with a cheerful can-do-attitude by Si­mon Henderson. Ben’s soldier father (also played by Murray) gives him a pair of binoculars before he heads off to war. The “noculars” will allow Ben to see his far-away dad. But Ben’s best friend Vince (Griffin McInnes) steals them, in a slow-motion fight complete with sound effects that gleefully recalls pitched childhood battles. And the next morning, after a fitful sleep, Ben decides he does­n’t want to face Vince at school. Ben’s mother (Andrea Dy­mond) won’t let him escape school that easily and while Ben stalls in his room, Luca, the girl monster, quickly reaches a long hairy arm out from under the bed to steal his cereal. This confirms Ben’s heretofore unproved theory that monsters are living under his bed and causing him sleep­less nights. As Luca, Jack crawls, sprawls and rolls her elastic limbs all over the floor, leaping with ex­citement at the thought of getting out from under the bed by taking Ben’s place at school and retriev­ing the binoculars. She’s charm­ing and fun and touchingly inno­cent. And very, very bouncy. Both end up on unexpected — and highly entertaining — adventures. Ben gets acquainted with lov­able dad monster, whose craving for food recalls the Cookie Mon­ster on Sesame Street. Luca finds school and the outside world a bit overwhelming with wonder­fully unpredictable and heartfelt results. Written by Kevin Dyer and directed by Halifax Theatre For Young People co-artistic director Tessa Mendel, The Monster Un­der The Bed is recommended for children ages five and up and will probably be best enjoyed by elementary school students, though there is plenty to enter­tain adults too. The action on the inventive set by Nathaniel Bassett takes place in a bedroom, with a trap door to a monster’s lair that’s the play­room every child dreams of, and against a backdrop of projections designed by Nick Bottomley that lift the production into a magical realm. Lighting by Robert Tracey creates a spooky atmosphere in shades of ghostly green, brilliant blue and pleasant purple. The Monster Under the Bed runs today at 2 p.m., Wednesday to Saturday at 7 p.m., Friday at 10 a.m., and Saturday and next Sunday at 2 p.m. Tickets are $15 adult, $10 child/youth and $40 family of four. Tickets are available at www.ticketpro.ca or 1-888-311-9090. The Monster Under The Bed is Halifax Theatre For Young People’s first play for younger audiences, and it is a playful and sweet one that will be filling Alderney Landing Theatre with giggles until October 28th, 2012. Ben is eight years old and his father has recently be deployed to a far-away conflict and entrusted him with a pair of binoculars (or ‘noculars, as Ben calls them) with the idea that he can look into them and catch a glimpse of Dad while he is away. When his friend Vince steals the ‘noculars Ben becomes afraid to go to school and face him. He ends up hatching a plan with the young monster under his bed, Luca, sending her off to school in his place to eat Vince and restore the ‘noculars. British playwright Kevin Dyer has written a fun script here where the ever hungry (and exuberant) Luca tries desperately to fit in at school while Ben is left to contend with her Monster Dad in the world of forgotten rubbish under the bed at home. Simon Henderson plays Ben as a sensitive and thoughtful child, with quick instincts and a strong sense of self reliance. He gives Ben a wonderful depth and specificity that allows him to rise far above the fact that Henderson is an adult playing a child allowing him to live on his own plane of existence. Keelin Jack plays Luca swinging between heartbreaking vulnerability of spirit and a wild, infectious happiness. Henderson and Jack mirror one another nicely. It is suggested that Ben and Luca have almost grown up like twins, although separately, one above and one under the bed, even sharing the same “Comfy” special blanket at night time. I wanted to see more of them playing together as it is clear that together they would make a formidable and imaginative team. Tessa Mendel’s direction is at its most glorious in the interactions between Ben and the Monster Dad, played by Christian Murray, who has almost entirely transformed into a character out of The Muppets. Henderson and Murray play so effortlessly together in their scenes, whether chasing each other, playing with toy soldiers or drawing out secrets, there is always a perfect mixture of real emotional depth and vivacious physicality under the bed and it is magnetic to watch. Things are a little more challenging at school because while Jack’s Luca is grounded in a firm sense of individuality and emotional depth, unafraid of a little bit of subtly, the rest of the characters in the outside world are not. Griffin McInnes’ Vince swings between being so bland that one wonders why Ben is afraid of him to being so ruthlessly malicious that one wonders why Ben is friends with him at all. McInnes hits his stride well at the very beginning and very end of the play when Vince and Ben are friends with one another and his dynamic with Henderson when fighting an epic, imaginary multi-weapon duel is perfect. Overall, Vince just needs a little consistency and a little balance. Andrea Dymond plays a gigantic caricature of a stereotype of a little girl as the wildly annoying Celine who feels a bit like “one of these things is not like the other” in relation to the far more subdued portrayals of Ben, Vince and even Luca. Much of the silliness at school comes from the fact that although Luca and Ben are not even the same species (Luca even has a tail!) she passes for Ben at school wearing only his t-shirt and his glasses. Yet, there are a few aspects of Dyer’s script that seem a bit too contrived to me such as how Ben’s mother conveniently walks “Ben” through the route to school, one that he presumably would know by heart by third grade. Also, I would have liked to see Luca having to invent far more reasons for “Ben’s” odd behaviour rather than the other characters just accepting blindly that he’s suddenly gone completely berserk. I also found it odd that Dyer has Ben and Monster Dad speaking to one another at at least a third-grade level while Ben’s mother (and sometimes also his teacher) speaks to him in baby talk. This may be a commentary on how oblivious adults can be in their interactions with children, but in this context it just seems inconsistent with the world of the play. In all, however, there are a lot of very silly moments and some very endearing ones as well as Ben and Luca learn about the power of friendship and kindness and facing the fear of the unknown. Nathan Bassett has created a very fun set with lots of nooks and crannies for monsters and shadows to pop in and out of and there is good use of projections and shadow by Nick Bottomley to create the world around the bed. Don’t be scared, even the littlest children will delight in the earnest sweetness of the monsters under Ben’s bed. Halifax Theatre For Young People’s production of The Monster Under The Bed plays at Alderney Landing Theatre (2 Ochterloney Street, Dartmouth, Nova Scotia) October 24-27th at 7:00pm, October 27 and 28th at 2:00pm and October 26th at 10:00am. Tickets are $10.00 (Child/Youth), $15.00 (Adult) or only $40.00 for a family of four (!). For more information or to book your tickets please call 1-888-311-9090 or visit this website. Halifax Theatre for Young People pulls the rabbit out of the hat again with a 90-minute historical drama full of intrigue and conflict. Last spring the city’s professional youth theatre company brought the 19th-century Nova Scotia tale of the SS Atlantic to life. 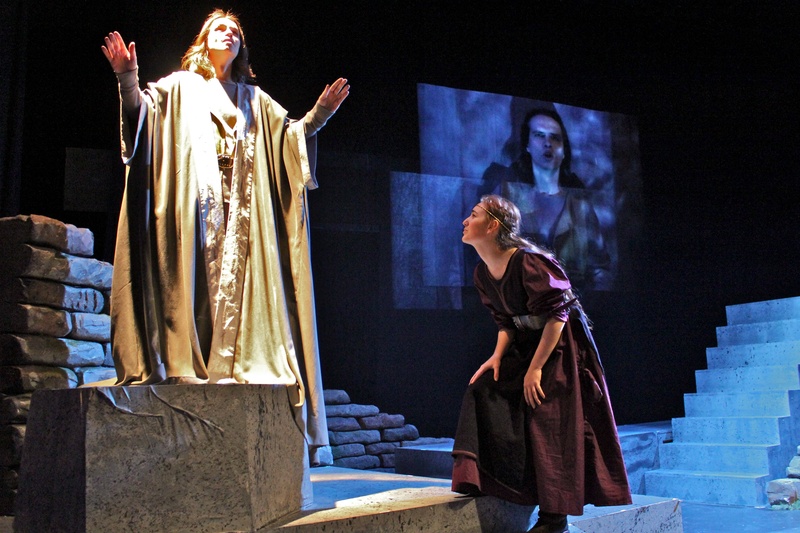 This spring it goes back in time to the early Middle Ages in Halifax-born playwright Paul Ledoux’s Merlin, the story of the famous wizard up to the point of Arthur pulling the sword out of the stone. This Merlin, subtly and skillfully incarnated by Gordon White, is not the mighty, wizened, white-haired magician. This a younger, troubled man, desperate to bring peace to his war-torn country through a new and just king. As the background to the more famous and familiar legend of the Knights of the Round Table, this is a compelling epic tale of youth, love, ambition, treachery and machination or magic. When Merlin has visions of the future and works to realize them, how much of what happens is preordained and how much is the result of free will and his own actions? “It’s both,” snapped my daughter, 10. Clearly, she was bored by the question but certainly not by the play. Directed by Tessa Mendel with a top-notch cast, Merlin moves swiftly through time and place from the reign of Merlin’s grandfather Vortigern to King Uther’s renewed attempt to repel the Saxons when his son, Arthur, and his daughter, Morgana, are both teenagers. Merlin is a vulnerable, anxious man who fears what his powerful magic can do. As he is thrust out of seclusion to accompany Arthur and Kay to King Uther’s armed camp, he looks back into his violent past. In the beginning, Merlin was a stammering, weak boy adored by his mother (Karen Bassett) and despised by his grandfather Vortigern’s young Saxon wife Rowena. She knows that unless she has a son, Merlin is the heir to the throne. Suddenly the Saxons start a war that puts Merlin and Rowena on the run until she cosies up to King Uther and Merlin goes off with the Duke of Cornwall. Leanna Todd is a deliciously rotten Rowena, a totally duplicitous, conniving person who uses her beauty, intelligence and limited magical powers to manipulate the men around her. The stage crackles with her intensity, and her motivation is easily understood given the fact she is a woman scrambling for power for herself and her child. That child, Morgana, is perfectly played by the red-headed Els Bullock, a Dalhousie theatre student. Morgana journeys in this play from a merry, confident young girl who can wield a sword better than any young soldier into a frantic young woman about to lose her dream to be queen, a dream fuelled by her appalling mother and squashed by her previously adoring father. Whether or not Arthur wants to be king ‘ and Truro actor Wayne Burns plays him as a confused, earnest and decent young man ‘ Merlin insists. Two strong local actors play the aging kings with a surprising depth and humanity, given their short scenes. Lee J. Campbell, fresh from The Road to Mesa on Neptune’s Studio stage, is the strong-willed Vortigern, and John Dartt is the flawed and failing Uther. Veteran actor John Beale brings three different types of men to life in smaller roles. The play is staged on set designer Bryan Kenney’s spare and effective structure of grey platforms and rocks with magical and moody effects of lights by Mike Mader and sound by Terry Pulliam. Jennifer Coe’s earthy period-style costumes place the viewer firmly in the hardscrabble times. Tessa Mendel directs for a wonderful clarity. Kids can connect easily to the lively young characters, including Drew O’Hara as Kay, as well as all the sword fighting, mystery and mayhem. Adults relate to the more seasoned, serious characters, lots of twists and turns and some philosophical questions about the nature of life. 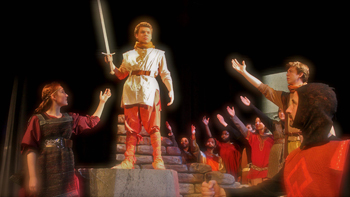 Merlin runs at the Bella Rose Arts Centre, Halifax West High School, Wednesday through Saturday, 7:30 p.m., with a closing matinee Sunday, 2 p.m. Tickets are $15, $10 for children or students and $40 for family of four. For tickets call 457-3239 or go online to http://www.bellroseartscentre.com/.